As you may have read on another thread, I recently purchased a '74 Comet. It has what I believe is a 302 engine and a Edelbrock Carb. Anyways...I went to start the car this morning, made it down the street and as I rolled to the first traffic light, the car rumbled and died. Started her right back up and it died again. Made it back home and let it sit. Fast forward to tonight, I looked at the fuel filter, it's getting gas fine. Then I pulled the air filter off and came across two hoses not plugged in. uh huh... Only due to my lack of being mechanically incline in this department, I can't figure out where this hooks into. It's the t-shape looking hose that goes into one hose. I looked behind the carb and can't see any opening. The closest part of the carb in the pick is capped off. So any help would be great. The second hose I spoke of, I didn't take a photo of but can provide more detailed photos tomorrow as I work on it. Anyone who has a moment to spare where I can email pics too or speak to, please feel free to reach out. Seems as simple as hooking things up but as of now can't find where it plugs too. Also, when I rev the engine, the car squels a little. My maintenance guy at work said that this is due to the belts being loose and just need to be tightened? Any thoughts here? is your PCV hooked up? can't really tell by the pic but the "T" is throwing me off. the squealing yes can be a loose belt or the PS pump, alt. just need to put an ear close and listen. 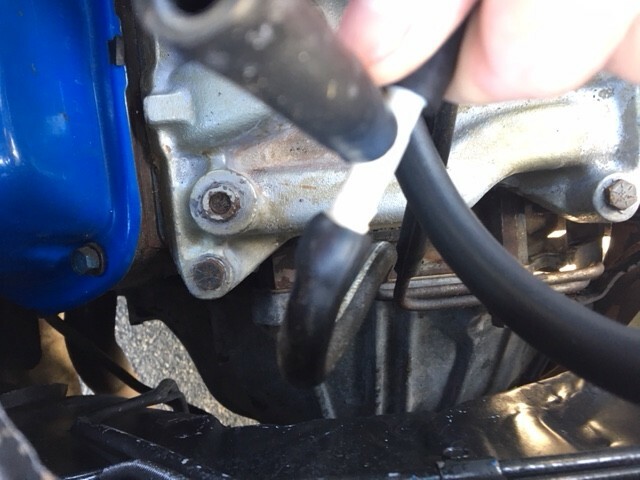 Additional Photos: The hoses in the first two photos, are the ones I am not sure where they hook into? 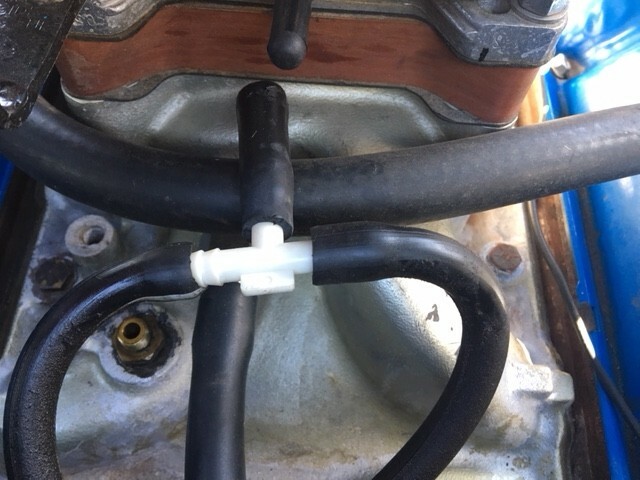 The big single hose looks like it is attached to a fitting on the actual intake manifold. I believe it should be hooked up to the PCV valve on the valve cover. The other hoses might go to the transmission. Do you know what transmission you have? Where do the two metal lines finally end up? The T is not factory. Someone did some modifications after installing the aftermarket intake and carb. Hi. I’m not sure of the transmission..previous owner didn’t say. I’ll have to take a look later and see where they end up. 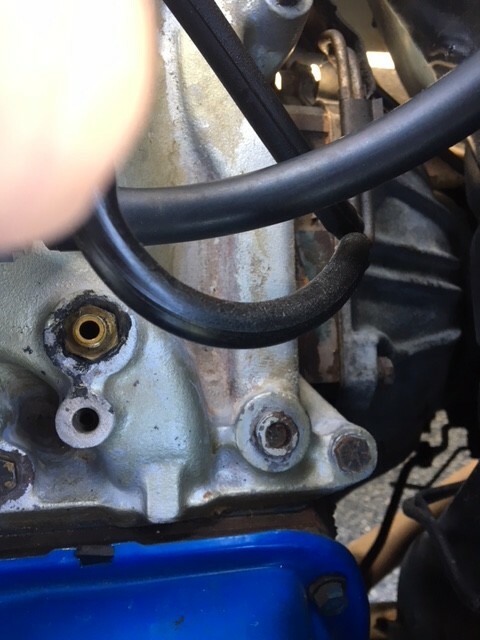 I would say the short hose coming off the "T" was connected to the brass fitting on top of the manifold, and may have been what was causing the squeel.. 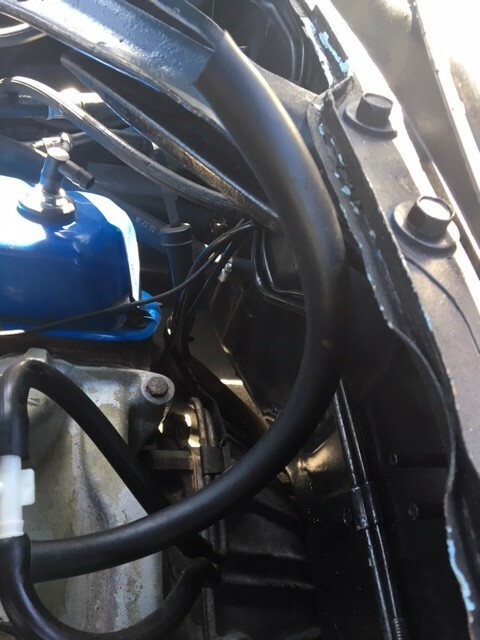 The large hose that is sliced off at an angle should go to the PCV valve and it coming off was likely what caused your engine to die, big vacuum leak to the intake manifold below the carburetor. Thank you. Yes those are where they went. 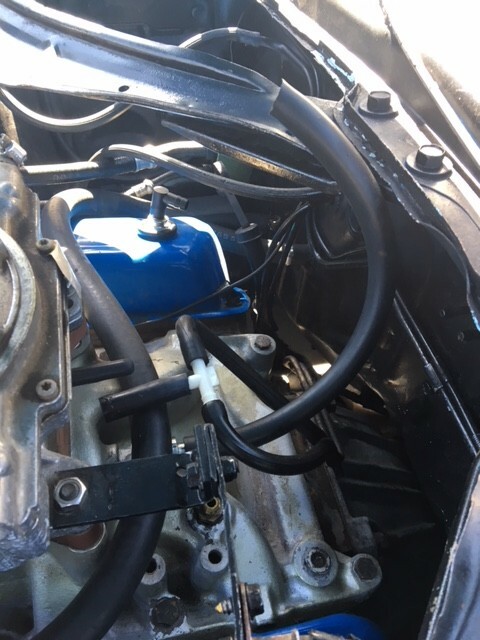 (06-30-2018, 12:43 PM)Don C Wrote: I would say the short hose coming off the "T" was connected to the brass fitting on top of the manifold, and may have been what was causing the squeel.. 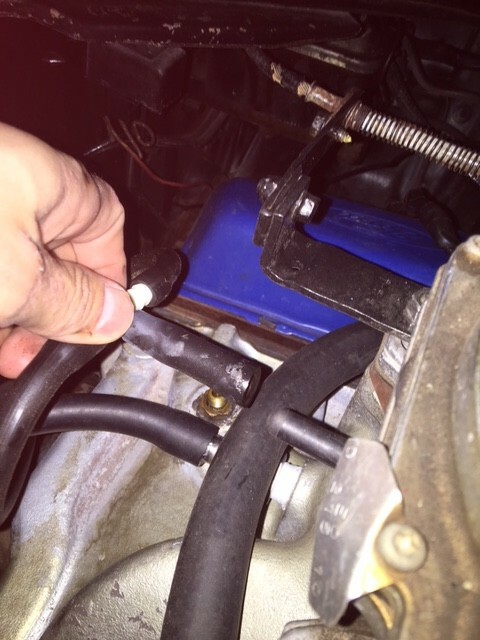 The large hose that is sliced off at an angle should go to the PCV valve and it coming off was likely what caused your engine to die, big vacuum leak to the intake manifold below the carburetor. Just to add to this, the two vacuum lines on the "T" are going to the hard lines that travel down to the vacuum modulator on the transmission. 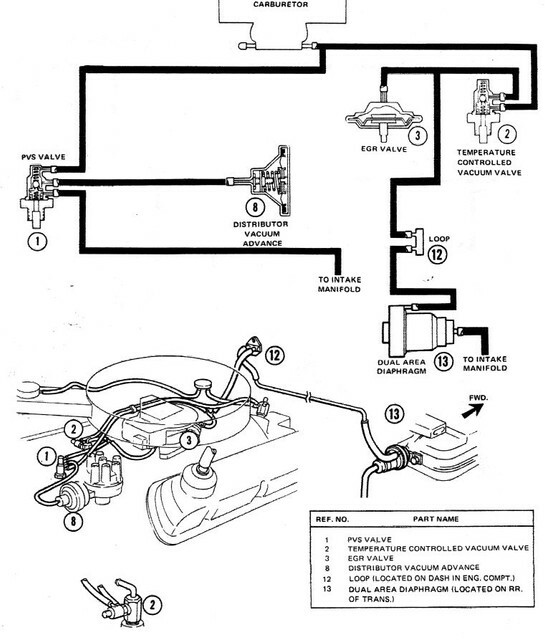 Starting in 72 or 73, Ford used a "dual area" vacuum modulator that, from what I've seen, raises the shift points when the EGR system was open. 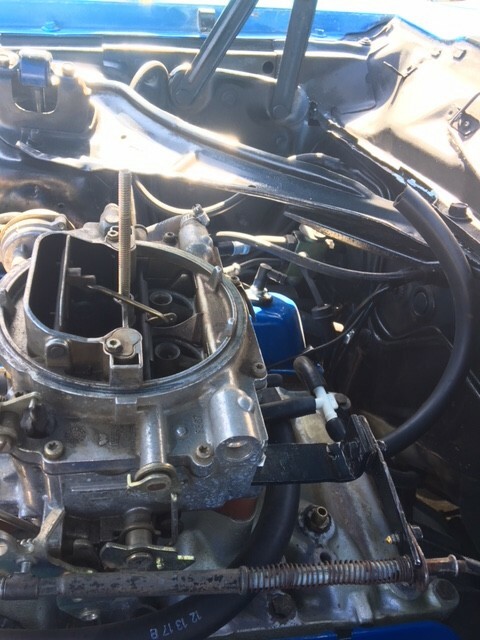 Since your intake has been swapped and the EGR has been eliminated, you can disconnect the vacuum line coming out the SIDE of the modulator. The line in the CENTER needs to go to direct manifold vacuum.